While I was out in the mall with my daughter, my husband was at home preparing this dish to surprise me as a pre-birthday dinner treat. I am ruled by my belly! 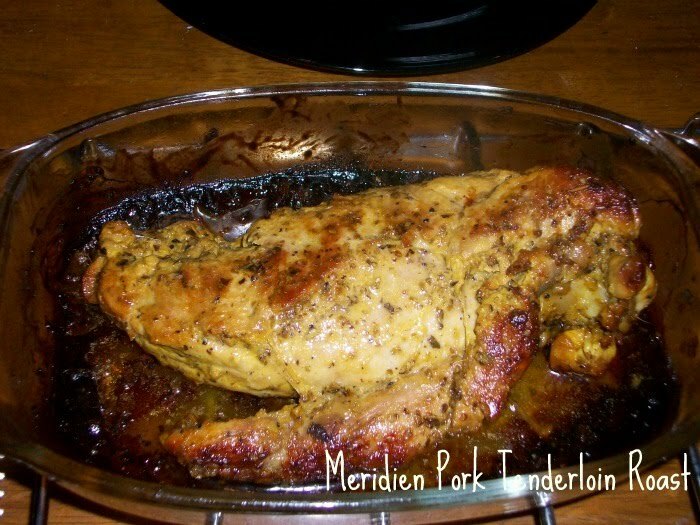 He calls it the "Meridien Pork Tenderloin Roast" a.k.a. Sarah's Birthday Surprise. It came out lovely. 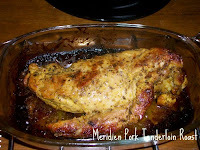 The pork was so juicy and tender and our house was filled with a lovely aroma. I enjoyed it so much I thought I'd share the recipe with you. It's real simple. Create a dry rub by mixing all the dry ingredients together in a bowl, make enough to cover entire slab. Massage dry rub onto slab, make sure to cover the entire tenderloin. Rub mustard on slab, don't be shy. Have fun with the mustard. Using a fork, poke holes around the meat so the heat can penetrate easily towards the center creating an even roast. Pre-heat oven to 250C for about 15 minutes. Drizzle olive oil all over your tenderloin or chop bits of butter and just loosely distribute all over the slab. Chuck your tenderloin in the oven for about an hour making sure to turn it over half way around for even cooking. When done, let rest for about 10-15 minutes depending on size. You may garnish with a couple sprigs of fresh rosemary on top (which we did not do. no need for garnish when your hungry). Good for 3-4 normal people but in our case 2-3 people. Dennis says: "this recipe is property of Dennis Sy and may not be recreated for commercial purposes. Only for your enjoyment at home. =)"